Switching genes on and off enables bacteria to conserve resources by producing proteins only when they are needed. 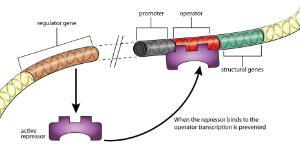 Make a model of an operon. Learn how the lac operon regulates the expression of bacterial genes essential for lactose metabolism. This complete "dry lab" activity contains all required materials.